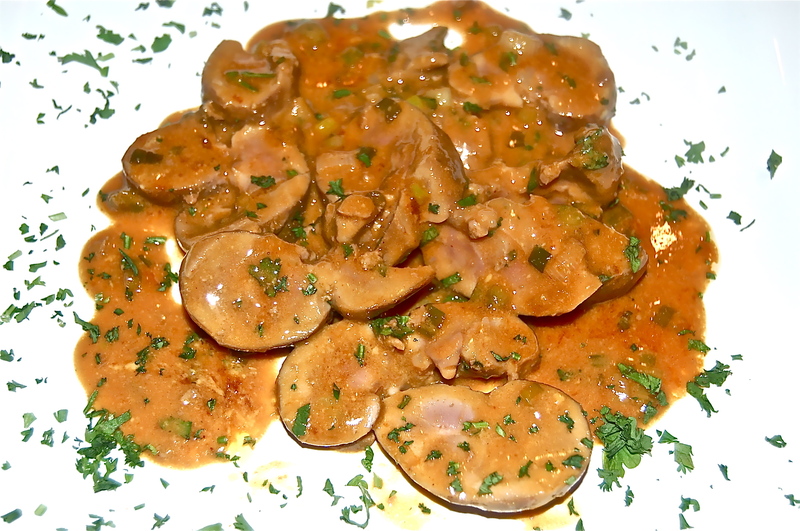 Veal Kidneys are not something you can find every day at the butcher shop. They generally have to be ordered in advance, that’s on the assumption that your butcher can get them at all. I waited two weeks until an e-mail from Fred Brill of Adam’s arrived, advising me that he expects delivery that week. “Did I still want them”. “You bettcha” I immediately e-mailed back. I picked up his complete order of 5 pounds, still vacuum packed by his provider. I re-vacuum pack them into 1 pound bags. That’s 5 dinners in the next few months. There goes our cholesterol count. 1. Whisk together the Mustard & 3 TBs of Butter to forma smooth emulsion. Set aside. 2. Remove the strip of white fat on the bottom of the Veal Kidney without piercing the flesh. If the butcher left any opaque membrane on the kidney, remove that as well. 3. Over medium heat melt the remaining 3 TBs of Butter in a medium skillet until the foam subsides. Roll the Kidneys in the melted Butter, then cook them uncovered for no more than 10 minutes, turning every minute or two. Regulate the heat so that the Butter is always very hot but not discoloring the Kidneys. They should lightly brown & lightly stiffen. Remove them from the skillet, keep warm for the few minutes it takes to make the sauce. 4. Stir the Shallots into the Butter in the skillet & cook for about one minute. Add the Wine & the Lemon Juice. Bring to a boil, scraping up the coagulated cooking juices & reduce the liquids to about 4 TBs. 5. Off the heat swirl in the reserved Mustard Butter mixture by spoonfuls into the skillet. Rapidly cut the Kidneys into slices 1/8 inch thick (they should be a light pink).Toss the slices into the skillet with any accumulated juices. Over low heat warm them for a minute or two. Add the chopped Parsley & Sprinkle with the Salt & Pepper. 6. Serve immediately, preferably on warmed plates.